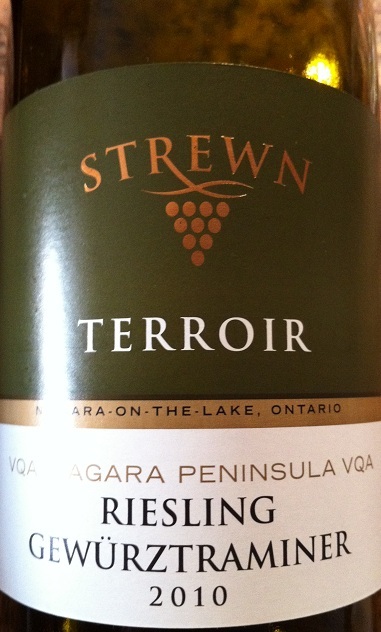 Strewn is a vineyard just on the outskirts of Niagara on the Lake (NotL), only a stone’s throw from Lake Ontario. Only a dozen years old now, it is a relatively young winery that is probably better known for its restaurant (La Cachette) than the winery itself. As a side note, if you are looking for a lunch spot in NotL make sure you drop by, the outdoor seating overlooks the vineyards and the staff mirrors the food, excellent. Strewn as a winery still represents one of the least expensive wine makers in NotL so for the budget minded it is an excellent place to go and taste their wines. We are going to talk about a wine from their Terroir range which comes from their best of the best, but they have two other levels which should work for those not wanting to put out the more expensive options. The visit to the vineyard was a pleasant one with a lunch preceding tastings. I decided to forego tasting anything but the Terroir series and when it was all said and done the Riesling-Gewürztraminer was suggested as the review wine of choice. As the only blended white wine of the week (for review) it was a bold choice, not only for the fact that Strewn has several single varietals that could have been chosen, but also as the market for blended whites out of Niagara is not huge, especially not a higher priced offering. Yet here we are, so it must have made the cut for the Strewn staff. On to the tasting! The pale coloured white wine instantly rears its Riesling head when you get a sniff, with a slight bit of petrol notes and crisp floral (think lilacs initially). The first few sips will bring forward a gentle acidity with distinctive but not overwhelming minerality. The fruit is gentle and compliments the structure well. The finish is long and you will start to get pineapple and peach notes the more you allow the wine to warm and open. Overall this is a good summer white wine with the potential to open a multi-course meal without leaving too much on the palate to take away from the food. A good offering from a young and often forgotten vineyard, at $17.95 you will find this wine is easy on the pocket book and will not embarrass you, not too bad for a sub $20 wine. The CWG Subjective Rating is 84 out of 100. This entry was posted in Canadian, Wine and tagged canadian wine guy, strewn, wine review. Bookmark the permalink.